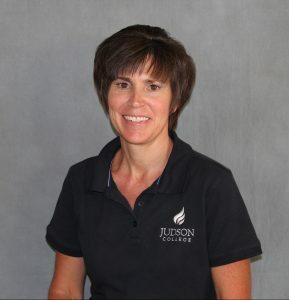 The Athletic Department is proud to introduce Bridget Goodnight, Head Basketball Coach for the Judson Eagles. This season will mark Goodnight’s twenty-first year of coaching; she brings to the Judson program coaching experience from various levels of the game, including NJCAA, NCAA II, and NCAA I levels. A Batesville, Miss., native, Goodnight says that she first heard of Judson College when she was a senior in high school. She began her own college basketball career at Northwest Mississippi Community College and continued at Blue Mountain College, where she competed against the Judson Eagles. During her time at Blue Mountain College, Goodnight was recognized nationally for her three-point and free-throw shooting percentages in the NAIA. The team’s first game will be a scrimmage against Gadsden State University October 30 at 5:30pm in Gadsden. The regular season opener will be at home November 8th against Southeastern Baptist College (Laurel, MS) at 6:00pm in Judson’s Riddle Gymnasium. Find a team roster at www.judson.edu/basketball/roster. Coach Goodnight and her team look forward to an exciting season!